Aug. 15, 1864 – Smithville, NC. I have just written a long letter to Bettie Hunter. The Cape Fear came up just a minute ago and Dr. Boykin, Hugh and Tom have gone to see if there are any provisions on board for us. They just returned and say there are none. We are nearly out of bread and don’t know where to get any. This morning the pilot of one of the ships lying in the river died of yellow fever. Ships that came in the last few days, say that yellow fever is raging in Bermuda, so the Ad-Vance will not touch there but proceed to Halifax. Aug. 16, 1864 – Smithville, NC. The boat came down today and brought abundant supplies of bread, bacon, pickles, corn meal, lobsters, tomatoes, watermelons, etc…. We went on the margin of the river and counted ten vessels lying in quarantine near here, besides an old ironclad which they say is worthless from the number of barnacles fastened to the bottom. Aug. 19: 1864 – Smithville, N.C. Last night we had a most delightful serenade. The serenaders were a Mr. Everett and his violin, and two Mr. Laniers, from Georgia, one with a flute and the other a guitar. They played “Ben Bolt”, “Bonny Jean” and two very spirited waltzes besides two tunes which I do not recollect. Aug. 20, 1864 – This morning between ten and eleven o’clock, we saw the Ad-Vance coming down beautifully from Wilmington, but she stuck on the bar and had to remain there till the next high tide, which was a little after seven, when she got afloat and came opposite this place and anchored. Father and Mr. Morris came ashore from the Ad-Vance while she was aground. 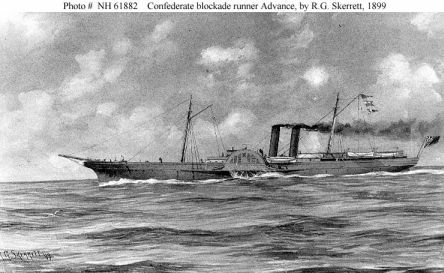 Aug. 22, 1864 – on board the Ad-Vance – Another attempt will be made tonight to run the blockade. About 13 steamers are in now. Eight large Yankee ships are so near that we can distinctly see them with the naked eye, but we will not encounter them as we go in the opposite direction, but there are five where we will have to go. Aug. 23, 1864 – Last night at about 8:30 we started off to make the attempt. We went very well until we got to the inner bar and there, as usual, we got aground and while we were vainly attempting to get off, the moon rose and shone very brightly and then of course we were effectively prevented from trying any more. After awhile, we got off and got back to Smithville, where we are lying now. Aug. 24, 1864 – The Lillian started out last night and it was thought she got through safely, but is not certainly known. We stayed on the cotton bales to see it go out, saw the Yankees throw several rockets, then saw the flashes and heard the reports of 15 guns. Aug. 26, 1864 – Last night we heard a quantity of guns firing and the occasion was not known until this morning, when it was found that the Hope was aground at Fort Fisher and a couple of sails were raised on board to get her off. The Yankees saw her then for the first time and began firing into her rapidly. The crew thought all was over and deserted the ship. One shot only struck the ship and that knocked a hole in the deck about the size of a man’s fist. The blockaders were fired on from Fort Fisher and that kept them in a measure… They got her off and came down here to quarantine ground to lay. It is a tremendous vessel, carrying 2000 bales of cotton, double the cargo the Ad-Vance carries, and does not draw as much water as the Ad-Vance, but this is thought to be the most trustworthy vessel at sea. The privateer, Tallahassee, is reported to have come in last night. Aug. 28 1864 – This is Sunday and promises to be more dull than any other day. This morning we saw a little torpedo boat coming down the river…. It is a regular little steam propeller, has an iron rod projecting from the bow to which a torpedo is attached. When they get it near enough to the Yankee ships, the torpedo is made to explode by pulling a string – I think – and the vessel is blown to pieces. Aug. 30: 1864 – An attack on Wilmington is daily expected. There are nineteen blockaders in sight of here and a turreted monitor. Sept-2, 1864 – Ad-Vance – Last night we got up steam about twilight and started out. We went splendidly, got over the rip as nicely as possible without touching and thought we would certainly go through, When the 1st Officer discovered something on the bar, and when the glasses were turned on, a large blockader was distinctly seen lying directly in our path. She saw us and flashed her light, so of course we had to put back to Smithville. It was supposed to be a monitor, as no masts were seen, and if it was, we would have passed so near that we would have been blown to atoms. On our way back to Smithville we passed the Coquette just going out, but she soon came back also. Sept 3, 1864 – Last evening we got up steam, heaved the anchor and were just on the point of starting, when Capt. 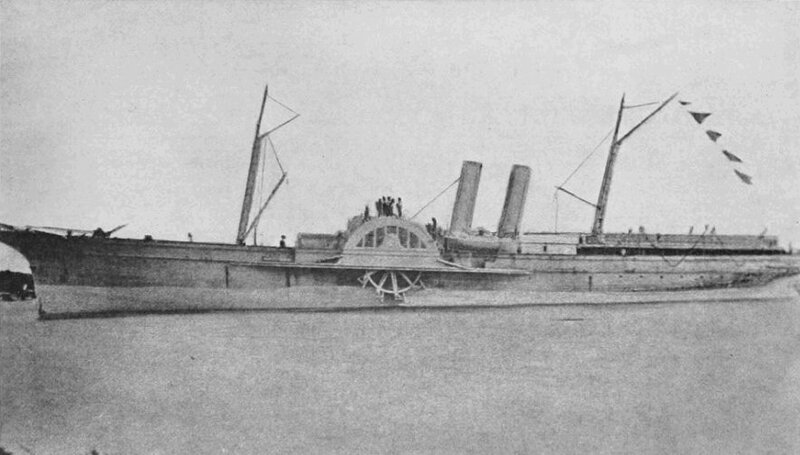 Wylie had a telegram sent him by a physician on shore, saying that he might not be well enough to navigate today if we got out to sea and consequently just had all the steam turned off and the vessel anchored again… It is reported that the Lillian was taken in the Gulf Stream, and the Mary Barnes ran into some obstacle going into Charleston. Sept. 4, 1864 – Last night we started out, as Capt. Wylie is still unwell, with another navigator to steer in case our Capt. should have a relapse. We got beyond the bar and the range lights were set, so we had to turn back, intending to try again, but the ship was so hard to turn that she had to be anchored and let the tide swing her around. We started out again, but by the time she got to the rips the tide had gone down so much that we could not cross them, so are back again for the night. The City of Petersburg missed the channel and got so far aground that she had to stay there until morning and was slightly injured. Sept. 5: 1864 – Wilmington – Last night for the 7th time an attempt was made to run out. We got to the rip, got aground and had just started off and were going at half speed, when the Old Dominion, which had started a little after us, actually ran into us. Mother and the small children were down between the cotton bales, while Mrs. Boykin and I were on top of them. One of the stewards, who was on the cotton bales with us, seeing the Old Dominion coming along at speed, said, “Look at the Old Dominion, she’s coming into us. Get a hold, get a hold.” And with that he tumbled off. Mrs. Boykin and I were much nearer the shock, and we thought he was in fun and stayed up there. We saw the boat booming but thought, of course, that they would take care and not run into us, but the first thing we knew there was a most fearful crash…. The bow of the Old Dominion was very sharp and strong, but our ship was so strong that it did not run in until it had scraped the length of three feet and a half… They say if this vessel had not been remarkably strong, it would certainly have gone down. Sept. 7, 1864 – Ad-Vance – This morning we came down to Smithville and anchored at our same old place. The Will-o-the-Wisp, the Helen, the Owl and the Lynz and other vessels are lying here in quarantine, having just come in. Sept. 8, 1864 – Last night as our pilot, Mr. Morse, had been ordered on another shift, another pilot was detailed to carry us out. He got on a spree and was not notified he was to go out on the Ad-Vance until about an hour before time for him to come on board. When he did come, the guard had to wake him up and bring him on board as drunk as a fish. Of course, we could not risk ourselves with him and have to wait until tonight. Sept 15, 1864 – Warrenton, N.C. – On the 8th we made our 9th attempt and failed. We got to sea that night and the pilot had just given the ship over to the Capt, when it was discovered that we were about to be surrounded… She was anchored in sight of the Yankees all day, and everybody thought it would be so perfectly desperate that Father and Dr. Boykin took their families off. The Ad-Vance got out that night, on the 10th. 35 shots were fired at her were heard at Smithville…. We went to Mr. Parsley’s where we got dinner and started home on a freight train at 4:00 pm … and got home a little after 8:00. Father went to Raleigh yesterday and came back today, He expects to go out on some other vessel on the next moon, but is very doubtful about taking his family. Father has decided not to take us with him as blockade running is so dangerous now…. Dec. 1864 – A few days after I last wrote in my diary, we were shocked to hear of the capture of the Ad-Vance. She was captured on Saturday, Sept. 11th, off Cape Hatteras. He arrived in Bermuda on the 28th, and did not go ashore but stayed on board the Virginia that night and started for Halifax the next day. Culpepper, Marilyn Mayer. Women of the Civil War South: Personal Accounts from Diaries, Letters and Postwar Reminiscences Jefferson, NC: McFarland, 2004. p. 7-10 ….. an excellent narrative.